Sociological studies of atheism have tended to coalesce around three primary themes: stigma, identity, and community. To date, however, no studies have taken a reflexive approach to these themes or applied them in the field to test their analytical utility as well as their relations in contemporary atheist experience. This study employs a mixed-methods approach that includes in-depth interviews (n = 19), participant observation, and one survey administered to two atheist groups, one local (n = 151) and one national (n = 456). Ethnographic findings confirm the central role of stigma, identity, and community in atheist experience and emphasize their nestedness in one another. Survey results find that atheist affiliates in both national and local groups rate political activism as more important than social reasons in motivating them to affiliate, while local affiliates rated social reasons significantly higher than national affiliates rated social reasons. Suggestions for future research include consideration of these themes’ connectedness in subsequent analyses and further inquiry into the functional divergences between local and national atheist organizations. The sociological literature on atheism is growing although the field remains nascent. The extant literature is now substantial enough, however, to identify three major themes around which research seems to have coalesced. These themes are stigma, identity, and community. The time is optimal then to consider the utility of these categories as the field moves forward and to reflect on their analytical usefulness in studying a phenomenon that is complex, dynamic, and garnering increasing academic interest. Stigma, identity, and community, as thematic tendencies in the sociological study of atheism, have unique time-spans of influence, literary lineages, and connections to literature outside of the study of atheism and irreligion. They rarely emerge proportionally in any given study of atheism and their prominence is not due to any one seminal work’s recognition of their application to atheism as a social phenomenon. Stigma and identity, for example, are major themes in popular discussions of atheism while community remains primarily an interest of scholars. Stigma has enjoyed a good deal of attention from social scientists while the study of atheist1 identity and community is less developed. Yet, these areas are intertwined in significant ways. Studies of atheist identity are incomplete without considering their stigmatized character and atheist communities cannot be understood without a consideration of how stigmatized atheist identities are enacted in safe social contexts of similarly stigmatized others. So while these themes might bring unique insights and histories to the sociological study of atheism, their nestedness in one another suggests that any evaluation of their usefulness might benefit from an approach that considers their connections as well as their particularities. This study amounts to what can be considered an “audit” of these themes’ utility as well as a targeted examination of their interdependent dynamics “on the ground.” By allowing them to guide a mixed-methods study of atheist organizations and their members in the field, I am able to consciously and reflexively test their congruence with observed phenomena as well as contribute substantively to the study of atheism by examining the relationships between themes. It is my hope that this approach adds something to both considerations of the sociology of atheism as a field and to the empirical study of organized atheism itself. In the following pages, I provide short reviews of the literature most relevant to the themes of stigma, identity, and community within the sociological literature on atheism rather than attempt to discuss the full breadth of these massive literatures in general. I will then discuss my ethnographic study of atheism in the Triangle region of North Carolina in the context of these themes and share the accounts most indicative of my experiences and findings. I follow the ethnographic analysis with a simple statistical evaluation of survey results obtained from one local and one national atheist organization. I conclude with a reflection on how the qualitative and quantitative results inform one another and suggest new directions for research in the field of contemporary atheism in the United States. In an important study on atheist stigma, Edgell, Gerteis, and Hartmann (2006) argue that “attitudes toward atheists tell us more about American society and culture than about atheists themselves,” and that their “analysis sheds light on broader issues regarding the historic place of religion in underpinning moral order in the United States” (p. 230). This study, as well as much of the academic literature on this topic that followed, which I will describe in the following pages, is as much about atheists as it is about the dynamic public discourses that shape and reinforce notions of cultural legitimacy. The nature of stigma toward atheists has also been taken up explicitly in recent studies that touch on its sociological and psychological aspects. Concerning the former, a study carried out by Cragun and colleagues (2012) found that “The strongest predictor of such discrimination was not theological atheism or agnosticism but self-identifying as an atheist or agnostic when asked what one’s religion is” (p. 105). They also found that “Non-religious people are substantially more likely to report experiencing discrimination in family settings and socially than they are in the workplace, school, the military or voluntary organizations” (p. 118). This finding was reflected in my own research, as I will discuss below. As for psychological theories of discrimination toward atheists, Gervais and colleagues (2011) argue that anti-atheist prejudice is an issue of trust. The provocative methodology involved posing hypothetical scenarios to participants in order to measure levels of trust exhibited toward various social groups using rapists, a universally distrusted group, as a control. Their findings reflected that atheists and rapists were trusted to about the same degree with several other marginalized groups (i.e. gays and Muslims) garnering significantly more trust among the participants. While equating atheists with rapists may seem extreme, the general frame of distrust seems consistent with the sociological findings of Edgell et al. (2006): that anti-atheist prejudice is a result of the construction of cultural boundaries that attempt to define in-groups and out-groups, solidifying cultural ties and reinforcing in-group trust at the expense of the social legitimacy of the marginalized out-group. This is a very short and not nearly exhaustive account of the literature on atheist stigma but I have tried to touch on representative findings that have driven the contemporary sociological study of atheist stigma. Taken together, anti-atheist stigma is indicative of shifting cultural boundaries in the United States that mark atheists as a distinct out-group (Edgell at al., 2006), these boundaries are characterized by feelings of distrust (Gervais et al., 2011), and stigma is most commonly directed toward self-identifying atheists as opposed to those who might merely express doubts or disbelief without the atheist or agnostic label (Cragun et al., 2012). The cultural significance of adopting “atheist” as a central identity has not been lost on leaders in atheist and secular social movements and discussions of atheist identity are as present in the popular sphere as they are in the academic study of atheism. Richard Dawkins and other “New Atheists,” among other popular figures in the atheist movement, have urged atheists to become more vocal and aggressive in regard to their own atheism (see for example Dawkins, 2006; Harris, 2004; Hitchens, 2007). The New Atheism’s rhetorical emphasis on atheist identity has been instrumental in prompting a renewed interest among scholars in the social dynamics of organized atheism and atheist identity. Cimino and Smith (2010) for example, have investigated the influence of the New Atheism and new media on atheist identity and how it has contributed to increased acceptance of atheists: “’Coming out’ … has not been simply a matter of expressing oneself as atheist along a well-worn legitimate route. It has involved emerging from invisibility to claim a personal and social identity that has carried a fair degree of stigma” (p. 140). They express their belief that this process is becoming more legitimate due at least in part to the New Atheism and its online presence, writing, “the substantial transformations in our contemporary mediascape are creating a new space for atheists to come out, speak out, and ‘meet up’ in a still largely religious society” (p. 147). This “new space,” as described by Cimino and Smith, is found online and in the public sphere in general, renovated by the influence of the New Atheism, which has provided the discursive framework within which atheists can engage with one another and construct atheist identities in a social setting. The social-psychological aspect of the construction of atheist identity is beginning to receive attention as well. Smith (2010) defines “identity” as “that which we use to locate and identify ourselves in social life” (p. 217),2 and offers “four major elements in the construction of atheist identity in America: (1) the starting point: the ubiquity of theism, (2) questioning theism, (3) rejecting theism, and (4) ‘coming out atheist’” (p. 210). Smith means these elements to function as a general framework for considering the social-psychological process of constructing an atheist identity toward which any given stage varies in importance for specific people. I found this framework helpful in considering the narratives presented to me by my participants, although it fails to account for types of theism and atheism, with the former often influencing the latter, especially in regard to highly politicized religion and atheism. For example, a highly politicized atheism is more likely to emerge out of more religiously and politically coercive social contexts (Campbell 2013; Smith 2013). The concept of atheist identity as an “achieved identity” (Smith 2010, p. 215) is quite new, and only now is it receiving scholarly attention as an identifiable social-psychological phenomenon. It is not a process that exists in a vacuum and it is characterized by the social, religious, and political dynamics of one’s environment. These dynamics, then, can also be said to characterize one’s atheism as well. Popular trends like The New Atheism, national and local politics, the religiosity of friends and family, and social media are only a few examples of elements instrumental in the adoption of atheist identities. The discussion of atheist communities remains primarily historical with only a handful of modern sociological treatments available to provide a point of departure for analyzing the role of atheist community in the Triangle. Because the studies are so few, I focus on three early sociological analyses to provide a feel for the short history of this research and the concepts that continue to influence the field today. A clue as to where the sociology of irreligion stood when Demerath and Thiessen (1966) wrote what might be the first essay on atheist community can be found in its introductory paragraphs where they say, “the sociology of irreligion remains in the womb,” and observe in a footnote that “Organizational studies of irreligion are non-existent” (p. 674). The study, as described by Demerath and Thiessen, “is an analysis of a small-town Wisconsin free-thought movement and its response to organizational dilemmas arising out of its irreligion. More particularly, it is an analysis of organizational demise” (p. 674). They go on to say that this freethought group, known as the Freie Gemeinde, “began to atrophy with the pursuit of legitimacy” (p. 674). Demerath and Thiessen make a distinction between this “atrophying”, legitimacy-seeking freethought group that operated within a religiously undifferentiated (Catholic) and rural environment and a more militant urban freethought group within a religiously differentiated environment. This tension between “militancy” and “legitimacy” within freethought groups, with the latter signaling demise, was an early and influential account of types of freethought groups that continues to inform contemporary perspectives. In a second essay, Demerath (1969) expanded on the binary of militancy and legitimacy with an ethnographic study that was framed not so much according to the dichotomy introduced in the 1966 essay, but as an argument for the advent of a new typological phenomenon: the religion-less church. The religion-less church was Demerath’s answer to the paradox of the apparent decline and liberalization of mainline churches and the concurrent struggle of freethought groups to establish strong identities and attract new members. Speaking of the obvious decline in size and influence of these freethought groups at the time, Demerath wrote that, “neither have experienced the surge of growth and influence that might be expected in an increasing(ly) secular society” (p. 202). Reconciling the surprising results of his ethnography with the ubiquity of secularization theory at that time (e.g. Wilson 1966; Berger 1967), Demerath theorized that, “a possible convergence is underway between the organizational manifestations of both religion and irreligion,” and that, “the convergence entails the growth of the ‘religion-less church’ as a phenomenon of our times” (p. 202). Perhaps the most significant contribution from this study is the observation of an internal conflict engendered by more “militant” members of atheist organizations and those who push for greater cultural “legitimacy.” Demerath conceded that, “the irreligious groups at issue are hardly unique. Many of the same dilemmas and adaptations are discernable among the mainstream churches themselves” (p. 202). This observation obliges us to consider to what degree we include irreligious organizations within any applicable theory in the sociology of religion and congregationalism, and in what circumstances they might exhibit divergent traits from religious groups. Staying on the theme of congregationalism, one of Campbell’s (2013) most important contributions to constructing a useful typology of freethought groups was his distinction between those groups that want to abolish religion (abolitionists) and those that want to replace religion (substitutionists) (p. 38). Not satisfied that this covers all the bases, however, Campbell goes on to make another binary distinction between “communal” groups that emphasize sociality and “associations” that focus on political and cultural activism (p. 44). In pointing out that organized irreligion can exhibit various manifestations and that different freethought groups might have fundamentally divergent agendas, Campbell lays a groundwork that does justice to the complexity of the irreligious response and illuminates the breadth of the terrain of this field yet to be studied and comprehended. More recently, Jesse Smith (2013b), has explained how personal identity and narrative inform atheist organizational experience and influence the larger conceptual group typologies above: “As atheists collectivize and coordinate, the values, motives, and goals they share come to reflexively ‘act back’ on the growing collectivity, eventually providing an organizational and interpretive framework that will help to set the parameter for future participants” (p. 86). In other words, individual motivations for membership or identification play a large part in composing the overarching ethos of any given atheist organization. Therefore, any structural explanation of atheist group formation or ideology is incomplete without a consideration of how individuals use the collectivity to inform and conceptualize their own identity. For my sample, I focused on two organizations from which I drew most of my interviewees. One I will call the Triangle Political Atheists and the other I will call the Triangle Social Atheists (TPA and TSA respectively hereafter)3. I focus on these two groups for a few reasons. First, this is a convenience sample of the atheist organizations located in my immediate area. Second, they are the largest atheist groups in the Triangle and maintain the most frequent and regular meeting schedules. Third, TPA is a political action group and TSA is a strictly social group, encapsulating two of the main motivations for affiliation with atheist organizations: the desire to affect political change and the drive to seek out and socialize with like-minded people (Campbell 2013). By focusing on functionally divergent groups, I was able to gain better insight as to whether a certain kind of person might be more inclined to join either type of group and to obtain a better understanding of the functional variety of atheist organizations. This is a mixed-methods study. First, I used an “extended case method” (ECM) ethnographic approach (Burawoy 1998; Tavory & Timmermans 2009) and conducted in-depth interviews with participants (n = 19) recruited using a snow ball sampling method in order to (1) consciously apply the themes of stigma, identity, and community to guide my research on organized atheism in the field and to (2) study directly the connections and fractures between these themes in individual atheist experiences. Second, I conducted a survey, providing a questionnaire to one local (N = 151) and one national (N = 456) atheist organization, to investigate divergences and similarities of attitudes and organizational dynamics between the local and national levels. In the survey portion of the research design, insights from the ethnographic portion of the study informed construction of the survey instrument making this a “qualitative dominant” mixed-methods approach (Tashakkori & Teddlie 2003). I use the justificatory framework offered by Greene, Caracelli, and Graham (1989) to provide the bases from which a mixed-methods approach was adopted. The use of mixed-methods here thus seeks “complementarity” at the analytical level where “qualitative and quantitative methods are used to measure overlapping but also different facets of a phenomenon, yielding an enriched, elaborated understanding of that phenomenon” (1989, p. 258). In this study, the focus on individual processual aspects of atheism in the ethnographic portion is in discourse with the focus on group and national-level attitudes reflected in the survey portion. At the level of research design, the use of mixed-methods is also “developmental” where “the first method is used to help inform the development of the second” (1989, p. 260). As I mentioned above, findings and themes revealed in the ethnography and interviews informed development of the survey questionnaire. Implicit in the purpose of this study is an “extended case method” (ECM) approach to the ethnography. Tavory and Timmermans write that “ECM reflects an a-priori theoretical framing. In that sense, ECM produces a theoretically driven ethnography, or what can be called ‘theorygraphy’, in which research activities aim to modify, exemplify, and develop existing theories” (2009, p. 244). By focusing on stigma, identity, and community in my interviews, I aimed to consciously and reflexively bring these themes, emergent in the extant sociological literature in atheism, to bear on concrete cases of individual and organized atheism in the field. To that end, I adopted an immersive method of participant-observation that allowed me to engage as fully as possible with the community of interest and the social and organizational dynamics that gave it form. I attended events featuring invited speakers, meetings where logistics and organizational issues were discussed, social nights at various restaurants and bars, and parties. I took detailed notes sometimes during but mainly after these events to document ideas and themes as they emerged in the field. The semi-structured, in-depth interviews I conducted were recorded and took anywhere from one to two and a half hours and often entailed the revelation of deeply personal and sometimes painful narratives as well as reflections of upbringing, personal growth, and the meaningful relationships that have shaped the lives of my participants. These conversations usually took place in cafes, restaurants, and other public venues4 and were guided by the stigma, identity, and community framework although I allowed the participants to discuss whatever they felt was most relevant in terms of their atheist experience. The surveys that were distributed to the memberships of the local and national atheist organizations employed a 7-item Likert scale meant to gauge the importance of several possible motivations for affiliation with an atheist organization. Each item was categorized as either a social or political activist reason for affiliation. To measure differences of means between the local and national atheist group on individual items, I conducted simple t-tests to see whether any statistically significant differences existed between groups’ motivations for affiliation. The survey also measured attitudes toward the idea of atheist congregationalism but those results are not addressed in the present analysis. Discussing instances of stigmatization directed toward their atheist identity with the participants in my study was, for obvious reasons, often the hardest part of the interview process. More often than not, conversations centered on stigma from the respondent’s family. As such, my research confirmed some of the findings from Cragun et al.’s article (2012). For my purposes here, I will focus mainly on this aspect of anti-atheist stigma in order to highlight its centrality in these findings. I will, however, report other instances and kinds of discrimination in proportion to their prevalence in my interviews, including an instance of social discrimination in the workplace. Before discussing these moments of stigma, it is important to note that my participants widely reported that the Triangle has been quite hospitable to them as atheists. This is not surprising given that my sample was selected to maximize people who have close ties with atheist organizations and who have successfully integrated themselves into communities of like-minded individuals. Atheists, though, are not usually shy about pointing out discrimination and the Triangle has all the hallmarks of a geographic area that is generally welcoming of a wide range of beliefs and lifestyles. It was actually pretty stressful for me, like, what do I do, what do I say to these people, what if one of these people comes up and starts attacking me, how am I going to handle it…it was actually fine, nobody did anything, not that anybody would assault us but somebody might try and argue with us and I’m not a very good arguer, but now that I’ve done it, I think it was easy. Megan also told me she grew up in a more conservative rural area about twenty minutes outside the Triangle. I asked her if she thought she would have a similar experience in the farmer’s market there. She immediately shook her head, “No … they would definitely not be a receptive audience.” So even though she felt much more comfortable being an atheist in the Triangle as opposed to other areas she has lived in, she still maintained some anxiety about being confronted. It is fairly easy to see how it might be possible to get along as an atheist in such a place. One can be an atheist and still go through the motions of religious observance if completely necessary. It is also much more acceptable to describe oneself as non-religious or doubting than to identify as an atheist. Embracing the former kind of identity is another way some atheists navigate the stigma associated with the complete rejection of religion and theism. The ability to hide one’s atheism is why the stories I heard in my interviews that dealt with discrimination or prejudice were primarily in the context of their relationships with close family and friends, the people who knew my participants best and became familiar with the full measure of their non-belief. Jason, for example, a young man who lives near the Triangle, didn’t “come out” voluntarily. As he described it, one day his girlfriend called him and said that they needed to talk. … so she drove over and said, ‘I’ve noticed a couple things lately: when I mention praying, you turn the other way or don’t say anything or sigh or do something like that, ’ and I told her, ‘no I don’t believe in any of that’ and I started explaining why and then she started crying like immediately and she was seriously about to break up with me … and she was crying most of the time and I was feeling guilty in a way and she didn’t know what to do. This was one of the first times Jason had to reconcile his newly adopted identity with its stigmatized status in the surrounding culture. This incident was exacerbated a few weeks later when Jason’s mother was speaking to his girlfriend about his non-belief and she referred to him as an “atheist.” Interpreting Jason’s adoption of the atheist label as new information and indicative of a more radical stance on his part, Jason’s girlfriend became upset all over again. While Jason and his girlfriend weathered this revelation and were still together during our interview, he told me that the issue is sure to become a bigger problem should they begin to discuss marriage and children. He also expressed something I heard from many of my participants: feeling guilty for causing pain to those close to him. This suggests that the feelings of stigmatization atheists experience are compounded by notions of self-blame and culpability. This person outed me to my mom through an email. He pretended to be another (member of an atheist organization), created an account and emailed my mother and told her I was an atheist … I didn’t want to come out. I don’t think I would’ve told her … there are just some people in your life that you … you want them to die not knowing so that they never have to deal with the idea of you going to hell. My mom has struggled for years with the idea that her only daughter will burn in hell. This is a clear instance of someone leveraging anti-atheist stigma and American hostility toward religious “out-groups” to purposefully harm someone in that out-group. In this small excerpt we see not only the prejudice of the stalker, but the stalker taking advantage of the prejudice of Tanya’s mother in order to disrupt Tanya’s personal relationships. On top of all of this, we see again the sense of guilt many atheists experience as a result of causing their loved ones’ emotional and psychological distress. Cragun et al’s (2012) finding that the workplace is one of the most common sites of anti-atheist discrimination is supported by my findings. This also echoes previous observations of atheism’s association with devil worship in some circles (Heiner 1992). Megan, Jason, and Tanya give us accounts of anti-atheist stigma in the contexts of the broader community, family, and in the workplace respectively. Few participants shared instances where they felt directly discriminated against by others outside of their personal relationships but when this did occur, it was similar to Megan’s account where it manifested primarily as an awareness of otherness in religiously normative settings. In interviews with other participants, it was in the form of interactions within the religiously normative atmospheres of certain institutions including hospitals and even the military. However, most experiences of stigma were reported at home and in the workplace, where participants spent most of their time and maintain their closest relationships. Jason and Tanya’s accounts of personal stigma are especially poignant and extreme compared to the other participants but they serve to highlight the reality of being openly atheist in the southern United States and the turmoil it can introduce to relationships with family and friends. The word “openly” is important here as these experiences, as with many other participants in this study, were directly related to their decision to publicly claim an atheist identity. While discussing instances of anti-atheist stigma with my participants was, at times, particularly difficult, I found that many of them became eager, and even lit up, when it came time to share their story about how they came to “realize” they were an atheist or about the process they went through that resulted in them claiming an atheist identity. Perhaps this is because deconversion narratives enjoy a rather esteemed position in American atheist culture (Chalfant 2011). One of the most prominent examples of this narrative form is Convert’s Corner on richarddawkins.net. Although no longer maintained by the website, Convert’s Corner served as an online space in which to share personal narratives of deconversion, primarily those initiated by a reading of Richard Dawkins’s books. Hundreds of testimonies are featured there and speak to the diversity of backgrounds and experiences from which people have come to their atheism. This narrative form was also on display in the more casual settings I found myself in with Triangle atheists outside of the interviews I conducted. TSA events were always social and during conversations members would sometimes refer back to moments that were crucial to them discovering their atheism. TPA events were also often followed by social events in which these stories were shared among members. Another popular trope was to refer back to an earlier conceptualization of atheism or religious skepticism one previously inhabited. “Back when I called myself an agnostic,” is one example or, “when I was a more angry atheist,” was another I heard from time to time. In all of these cases, a linear evolutionary progression is insinuated that reinforces feelings of philosophical and intellectual development among individuals and the group. This is an important observation as it underscores the dynamic conceptual processes continually at work despite the “achieved” nature of atheist identity (Smith 2010). The suggestion that an atheist identity is indicative of intellectual or philosophical maturity was salient in interviews with several participants who described coming to their atheism after a period of intense and sometimes tortured reflection. It is hard to ignore the comparison here to explanations in classical anthropology to initiation rites and liminality. As Victor Turner (1966) described it, “Liminal entities are neither here nor there; they are betwixt and between the positions assigned and arrayed by law, custom, convention, and ceremony.” Indeed, some of my participants described to me, quite strikingly, the anxiety produced by feelings of groundlessness and ambivalence as they struggled through the process of losing their religion. Vishnu, a young man living in the Triangle and a member of TPA, described a particularly deep introspective journey to me that ultimately resulted in a firm skepticism of anything supernatural, including theism. Having been raised Hindu in India, his family, and especially his father, looked to their family guru for spiritual guidance. When Vishnu began considering spiritual issues as a child, he took the exercise seriously. He told me that the idea of God and Atman, which is often defined as the human soul, was something that piqued his interest at an early age. I was like what is this thing, I want to get to the root of this, you know. So I started reading books and all that stuff, so to me … what I got out of all the books was, so basically, you go through all this training, practice, religion, all that stuff to basically become one with God … it’s a quality where there’s no conflict, there’s no hurt, so naturally I wanted to become that. My ideal dream would be to go to the Himalayas and practice meditation and be free of all that. This fascination stayed with Vishnu for years into young adulthood, until he read the works of Jiddu Krishnamurti, who wrote on spirituality and philosophy in the 20th century. Krishnamurti had a profound effect on Vishnu. As Vishnu told me, “He said … you shouldn’t accept any authority on spiritual matters or matters of soul. You have to discover it for yourself.” This eventually led to Vishnu rejecting the religious tradition he had been brought up in and embracing a naturalistic worldview that rejected any kind of supernaturalism, although he’s hesitant to call it atheism. “Atheism is the best thing to describe … it isn’t really atheism or agnosticism … whatever there is, there is. There is truth.” Krishnamurti’s imperative to reject religious authority, then, extends to any label, including atheism, that might confine Vishnu’s worldview in any way. For about a week, when I was really starting to realize and internalize the fact that I don’t believe in any of this stuff, I was extremely paranoid. I would drive especially carefully on my way to work, really thinking, ‘I cannot wreck and die because if I do I might go to hell and I need to consider all this before I take a chance on dying’ … and I tried my hardest to avoid thinking about it … I spent the whole week in bed … I would sleep as much as I could because to be awake meant that I had to think about it and it was scary and it was stressful … and I was waking up each morning a little more on the side of, ‘You know I don’t need to be stressed about this. It’s OK that I don’t believe it. If it’s not true, then I don’t need to be scared.’ Waking up each morning, feeling a little bit better. Like Vishnu and Jason, Aaron’s religious upbringing engendered in him an urgency to undertake an earnest analysis of his own opinions regarding religion and theism. Also, like Jason and Aaron, the result was an abandonment of both. While the above instances of deconversion are of a more intense philosophical nature, not all of my participants expressed having had such an experience. In fact, of the nineteen people I interviewed, six grew up in generally secular contexts and never gave much credence to theistic belief or had much trouble coming out as atheist. Of the remaining thirteen who were raised in religious households, none of them reported having absolutely no trouble in their deconversion but they each varied considerably in the psychological and social toll the experience had on them. The label of “deconversion” seems inappropriate in Sarah’s case. Rather, she seemed to articulate a scientific disposition that engendered a “deafness” or indifference to religion and religious ritual that had been there for as long as she could remember (Coleman III et al. 2016; Douglas 1970). In terms of coming to identify as an atheist, it was simply a matter of learning the meaning of the word. “I think when I was 16 to 18, I would’ve called myself agnostic,” she told me, “but when I actually got proper definitions on agnosticism and atheism, that’s when I would say I’m an atheist.” Sarah described to me an implicit or latent atheism that had been there from her earliest memories and that only needed the language for it to become an identifiable element of her life and identity. She came to her atheist identity naturally and intuitively and did not experience the intense, condensed period of introspection described by Vishnu and Jason. Smith’s (2010) four-step processual framework for constructing atheist identity (described above) was helpful and consistent with my findings. Vishnu, Jason, Aaron, and Sarah all were raised in ubiquitously religious contexts, experienced a period of doubt or skepticism, rejected the propositional and moral claims of those traditions, and experienced some measure of claiming a non-religious identity although Vishnu and Jason avoided using the word “atheist” and Aaron was not “out” to his family. I offer these examples, though, because they were both typical of my findings and because they complicate a straightforward framework for mapping this process. To be sure, Smith does not claim that this four-step process is all encompassing but that it offers a useful general trajectory of the social-psychological processes of atheist identity construction. Still, the reports of these participants suggest the need for reconciling research in processual understandings of atheist identity with typological approaches (e.g. Norenzayan & Gervais 2013; Silver et al., 2014). I found the binaries presented above in the literature review by Demerath, Thiessen, and Campbell (association vs. community, abolitionist vs. substitutionist, militancy vs. legitimacy) not only applicable to organizational dynamics among atheists in the Triangle but strikingly indicative of various transformations and challenges I found these atheist organizations to be experiencing. To start with, the most obvious and thus far institutionalized separation that I found was that between “association” and “community.” I already described this study as primarily interested in the social dynamics within and between the Triangle Political Atheists and the Triangle Social Atheists. My selection of these groups was neither arbitrary nor the labels I chose of “political” and “social” a projection of my own subjective evaluation of their functions. Rather, the TPA emerged from the TSA as a project among its members to create an explicitly political and activist group. The unproblematic growth of TPA out of TSA is an example of a clear distinction that should be drawn between the three dialectical binaries presented above. These associations and communities were not inherently antagonist entities and all my participants expressed an appreciation and an awareness of the role and necessity of both the TPA and the TSA. The other two binaries, however, of abolitionist/substitutionist and militancy/legitimacy are necessarily antagonistic, predicated on divergent strategic goals and visions within organized atheism. One cannot seek to abolish congregationalism and replace religious congregations nor can one advocate for a militant approach of religious critique while seeking legitimacy within the religious sphere. To explain atheist organizations and communities with any accuracy, one must acknowledge these competing tendencies and the reality of organizational conflict. In a survey I conducted with the help of the TPA and the American Humanist Association (AHA), the largest secular humanist organization in the United States, I attempted to gauge attitudes on these subjects in order to better understand how Triangle atheists might compare to members of national organizations in how they conceive of their membership in a particular atheist organization and whether local affiliation differs functionally from national affiliation in any significant way. Surveys were made available to those on the email list of both organizations separately in the summer of 2013. Out of around 700 people on the TPA email list, 151 people filled out the survey, while 456 people filled out the AHA survey which was included in their national newsletter going out to approximately 43,000 email subscribers. This corresponds to a response rate of about 22% and 1% respectively. These are very weak response rates so my analysis can only suggest possible associations for future research rather than stand as conclusive evidence of any fundamental patterns in motivations for affiliation in atheist organizations. That said, I found some significant differences between TPA and AHA members in how they rated motivations for becoming members in their respective organizations. In Figure 1 below, I show the results of a question where I asked, “On a scale from 1 to 7, with 1 being “not at all important” and 7 being “extremely important,” how important were the following aspects of membership or participation that drove you to participate in or become a member of a local or national atheist/agnostic/freethought organization?” A simple t-test compared the average means of scores on these measures between the TPA and the AHA. The six top rows reflect political motivations for membership while the four bottom rows reflect social motivations. 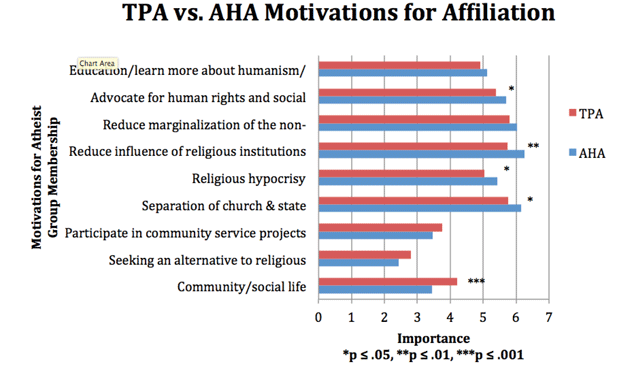 TPA vs. AHA Motivations for Affiliation. Both TPA and AHA members rated political motivations for affiliation higher than community-based ones. At both the national and local levels, political motivations for affiliation seem to trump social motivations quite conclusively. In no category did the average TPA score for a social based reason exceed the rating for a political category. It is therefore not true that local atheist organizations care about social reasons for affiliation more than political reasons. However, I found statistically significant differences in means on the items “Advocate for human rights and social justice,” “Reduce influence of religious institutions,” “Religious hypocrisy,” “Separation of church and state,” and “Community social life” with the AHA rating each of the political reasons higher than the TPA. Furthermore, the greatest and most significant difference is on the “Community/social life” measure which TPA members rated, on average, as more important than the AHA. Details are included in Table 1 below. Motivations for Atheist Group Membership. *p ≤ .05, **p ≤ .01, ***p ≤ .001. In the interviews I conducted and in the conversations I observed in the field, stigma and identity were common themes that were often intertwined. Many of my participants’ most salient experiences of anti-atheist stigma were in conjunction with coming out or their atheism being discovered. As with Tanya and Jason above, these experiences commonly followed on the heels of recently adopting an atheist identity. Furthermore, five of my participants were not yet out to their families at the time of my interview with them. Anti-atheist stigma for them included the inability to discuss their non-belief openly and share their atheist identities with others. Thus, for these participants, their accounts of anti-atheist stigma were simultaneously accounts of their struggle with atheist identity. However, because I targeted members of local atheist organizations, these often difficult testimonies were balanced by emotionally positive stories of finding sympathetic and like-minded communities of fellow atheists. Through my interviews and participant observation, I found these communities to be largely predicated on shared experiences of stigmatization and “achieving” atheist identities (Smith 2010, p. 215). It was common for members to discuss religiously normative political activity at the local, state, and national levels as well as share with one another what books, speeches, or experiences led them to or strengthened their atheism. Additionally, the survey I conducted offers some evidence that the nestedness of stigma, identity, and community is realized in motivations for affiliation in atheist organizations. Even for local organizations, it seems that political activism is still salient for most affiliated atheists indicating that their perceived marginalization is driving much organized atheist activity. Social and community-based motivations for membership appear to be prominent but secondary, even at the local level. However, members of TPA rated community/social life significantly higher as a motivation for membership than members of the national-level AHA. Ethnographic analysis adds some texture to this last finding. As I mentioned, TPA and TSA were the largest and best-organized atheist groups in the Triangle but TPA was clearly the most active with monthly events featuring invited speakers and various political initiatives that included protests and other kinds of local activism. The monthly events were often well attended usually boasting around fifty to one hundred or more attendees depending on the speaker. Behind the scenes of all of this activity, however, were a core group of five to ten volunteers who did nearly all of the organizing and work. They were not only colleagues in activism, though. They were close friends who socialized outside of TPA functions regularly, babysat each other’s kids, took vacations together, and celebrated with and supported one another through various successes and hardships. A weakness of the survey instrument used here might be that I asked members of TPA why they were driven to join but I did not ask why they have stayed or have continued to contribute to organizational efforts. While the members of TPA’s core group were each certainly driven to create or join TPA for reasons related to political activism, it seems that their continued involvement has been underscored by the development of a strong social network that would likely survive the failure of the TPA as a formal organization. What we have, then, is a community that is formed through shared experiences of stigma and identity but which ultimately transcends its formal political manifestations in the personal and multiplex relationships it has supported and given rise to. Throughout my research, the themes stigma, identity, and community were powerful guides in investigating atheism in the Triangle. My interviews, observations, and quantitative data bear out their relevance to the sociological study of atheism and I found it difficult to imagine ways in which my study could benefit from a departure from these categories. Indeed, when coding my interviews and observations, these categories provided a useful framework for considering how individual atheist experience interacts with motivations for affiliating with atheist organizations and the subsequent feedback loop that develops between personal and social atheist experience. From an “extended case method” perspective, stigma, identity, and community are validated by this study as useful conceptual categories for a processual understanding of atheist experience. Atheist identity is nested in experiences of stigmatization and atheist communities are predicated on shared perceptions of atheist identity as marginalized and counter-normative. By comparing these ethnographic findings with the quantitative analysis, we gain insight into how this nestedness is manifested differently at local and national levels. Local groups, even the ostensibly political ones like the TPA, provide a safe and welcoming social space for atheists who have experienced stigma or are seeking support as they transition from religious beliefs, communities, and identities. At the national level, with opportunities for face-to-face encounters and the development of strong social ties with other atheists less likely, political motivations for affiliation with atheist organizations were more strongly emphasized. This means that rather than providing a common emotional and experiential foundation for the formation of personal relationships in a local setting, atheist stigma and identity are leveraged to produce political solidarity in the context of a social movement. Local atheist groups are ideal contexts for personal support while national groups seem better suited to provide broader ideological logics or “frames” (Benford & Snow 2000; Snow et al. 1986) for experiences of atheist stigma and identity and provide a venue for directing frustrations toward national and even international political agendas. This prompts interesting questions for future research related to how this functional divergence affects or is affected by the members of these organizations. Do local and national groups foster different attitudes among their membership resulting in these differences or are they attracting atheists who value different things? If the latter, how might these atheists differ in their experiences of stigma and identity? Are those “newer” to their atheist identity more likely to join for political rather than social reasons or vice versa? If so, does this also mean either local or national atheist organizations are more likely to attract atheists at different stages in an extended identity process? These questions and more follow from a recognition of qualitative differences in experiences of stigma and identity and the functional divergence of atheist organizations at the local and national levels. The preceding study sought to identify then consciously and reflexively apply key themes in the sociological literature on American atheism to an analysis of atheism “in the field.” It used a “mixed” and an “extended case” methods approach to investigate what I have called the “nestedness” of these themes and their relational dynamics at the local and national levels. Two primary areas for future research suggested by this study include (1) looking into what might be gained from combining processual and typological understandings of atheist identity and stigma and (2) working toward a more comprehensive appreciation of functional divergences between local and national atheist organizations. More generally, this research points to the project of synthesizing social-psychological and structural theories of contemporary American atheism. How broader narratives of atheist experience, often controlled and disseminated by atheist organizations and public figures, inform individual atheist experience, and vice versa, remains unclear. Considering these elements as mutually constitutive warns us against essentializing social-psychological processes of atheist identity construction or adopting a perspective that erases integral cognitive aspects of affiliation in atheist organizations. Atheism, as a social phenomenon, requires scholars to be continually attendant to these interconnections and mindful of the emergent character of stigma, identity, and community from and toward one another. 1I employ the term “atheist” in this paper to denote the shared belief among all of my participants that God does not exist. As I will describe below, some of them had both social and philosophical reservations about applying the term to themselves. In the end, however, all agreed that “atheist” was a useful label that related as accurately as could be expected their opinion on the existence of God. 4Three of my interviews took place in the homes of the participant I was interviewing. Berger, P. L. (1967). The Sacred Canopy: Elements of a Sociological Theory of Religion. Garden City, NY: Anchor Books. Campbell, C. (2013). Toward a Sociology of Irreligion. London: Alcuin Academics. Dawkins, R. (2006). The God Delusion. New York, NY: Houghton Mifflin Company. Demerath, N. J. III and Thiessen, V. (1966). On Spitting Against the Wind: Organizational Precariousness and American Irreligion. American Journal of Sociology 71(6): 674–687, DOI: https://doi.org/10.1086/224224 PMid: 5952363. Douglas, M. (1970). Natural Symbols: Explorations in Cosmology. New York, NY: Routledge Classics. Gervais, W. M., Shariff, A. F. and Norenzayan, A. (2011). Do you believe in atheists? Distrust is central to anti-atheist prejudice. Journal of Personality and Social Psychology 101(6): 1189–1206, DOI: https://doi.org/10.1037/a0025882 PMid: 22059841. Greene, J. C., Caracelli, V. J. and Graham, W. F. (1989). Toward a Conceptual Framework for Mixed-Method Evaluation Designs. Educational Evaluation and Policy Analysis 11(3): 255–274, DOI: https://doi.org/10.3102/01623737011003255 http://dx.doi.org/10.2307/1163620. Harris, S. (2004). The End of Faith: Religion, Terror, and the Future of Reason. New York, NY: W.W. Norton & Company, Inc..
Hewitt, J. (2000). Self and Society. Needham, MA: Allyn & Bacon. Hitchens, C. (2007). God is Not Great: How Religion Poisons Everything. New York, NY: Hachette Book Group. PMCid: PMC1950434. Smith, J. M. (2010). Becoming an Atheist in America: Constructing Identity and Meaning from the Rejection of Theism. Sociology of Religion 72(2): 215–237. Tashakkori, A. and Teddlie, C. (2003). The past and future of mixed methods research: From data triangulation to mixed model designs In: Handbook of Sixed methods in social and Behavioral Research. Thousand Oaks, CA: Sage, pp. 671–701. Turner, V. (1966). The Ritual Process: Structure and Anti-Structure. Ithaca, NY: Cornell University Press. Wilson, B. R. (1966). Religion in Secular Society: A Sociological Comment. London, England: C.A. Watts & Co. LTD..